I’ve not yet "upgraded" my 17 inch MacBook Pro (my "main machine" as I call it) to Lion. There’s a number of reasons for this – too many to go into here, but I think it’s probably a case of if it ain’t broke then don’t fix it. I know I’m going to have to do it sooner or later as at some point they’ll be some software that I can’t live without that will only work on Lion. But for the moment my Lion experience is limited to my 13 inch MacBook which was upgraded the day that the new OS was launched. The MacBook is 4 years old and runs like a lame dog. It always has done to be honest. There’s no way I could seriously use Final Cut or Photoshop on it for example. 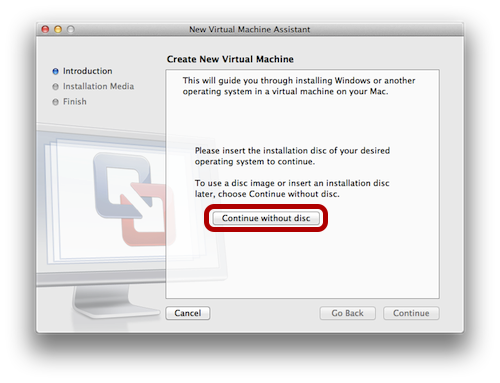 It does have VMWare Fusion installed but if I want to run my Vista VM or my Windows 7 VM, forget it. I installed Lion on it, "because I’m an Apple Geek" and because I didn’t want to be left out. I’d already gone on record at the MacBites Live event when Lion was demo’d and also on MacBites episode 51 as saying that there was nothing in it for me. However, it’s always handy to have an installation of Lion to tinker with plus, as a Podcast Host, I regularly have to check out some piece of software which no doubt will come with a 30-day trial at the end of which I’ll have to either buy it or remove it. So I decided the way forward was to create a Lion VM. The problem was that VMWare Fusion 3 (version 4 has just been released but at the time of writing I haven’t bought it) doesn’t support Lion as a Guest OS. 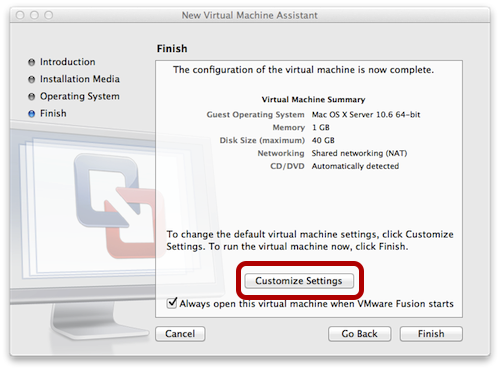 Although Parallels 7 does allow you to create a VM with Lion as the Guest OS, it is activated and costs £35 a seat and although you are supposed to be able to convert Fusion VM’s to Parallels (I have 7 VM’s), I’m never quite sure how well that works. Using Disk Utility, create a new image. To do this, select File > New > Blank Disk Image. 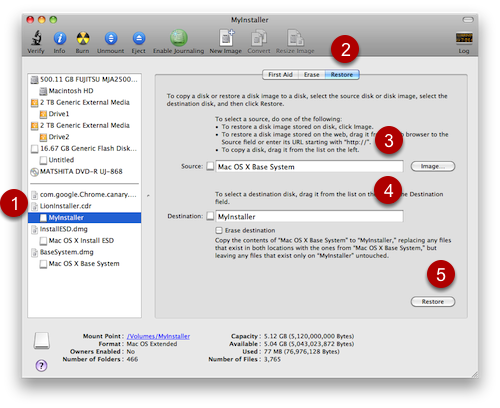 Name: MyInstaller – you can name it whatever you want, but be sure to modify the steps below accordingly. Once the new disk image is created, it should automatically be mounted and you should see "MyInstaller" listed in the Finder sidebar. 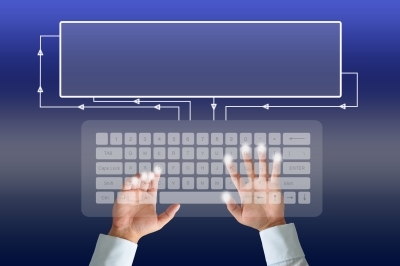 If it does not automatically mount, simply find the CDR file and double-click it. 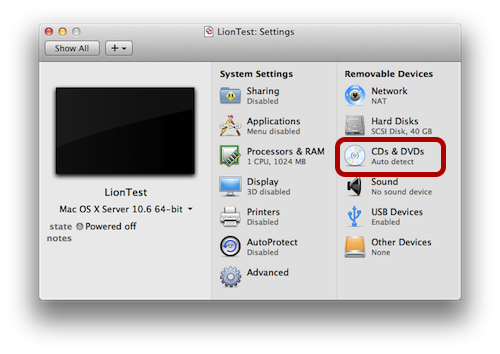 To do this, locate the file “Install Mac OS X Lion.app” (this is the file that you should have downloaded from the Mac App Store when you bought Lion), right click on it and select “Show Package Contents”. 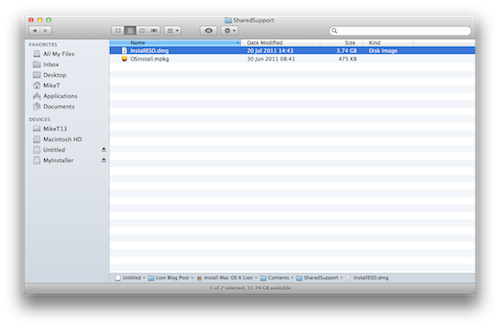 Open the "Contents" folder and then the "SharedSupport" folder and double-click on InstallESD.dmg to mount the image. The mounted image should display as ‘Mac OS X Install ESD’ in the Finder Sidebar. 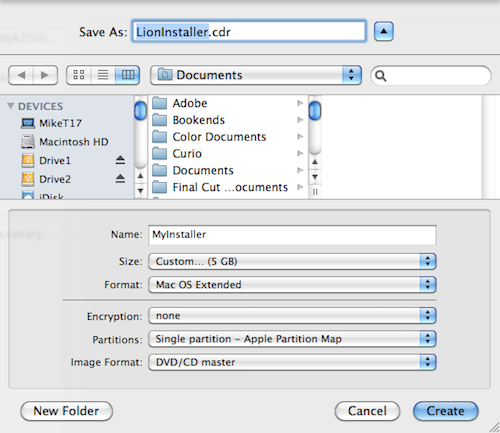 The Lion installer image contains some hidden files. 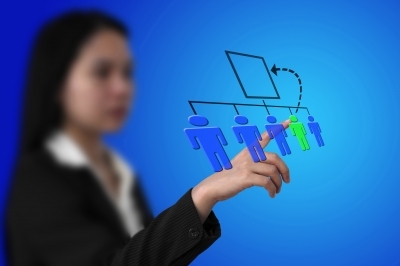 To get to them you’ll need to run the Terminal application. One of these hidden files is BaseSystem.dmg which is used to boot the system. Open the Terminal application and at the $ prompt, type: cd "/Volumes/Mac OS X Install ESD"
The volume will mount as "Mac OS X Base System"
Ensure that your installer image created in step 1 is mounted (if it isn’t find the file LionInstaller.cdr and double click it) because the entire contents of the base system needs to be copied to your installer image. I recommend using the Restore feature in Disk Utility. Be aware that if you chose to "Erase destination", your installer image will now have the same name as the source, Mac OS X Base System. If so, rename it back to ‘MyInstaller’. 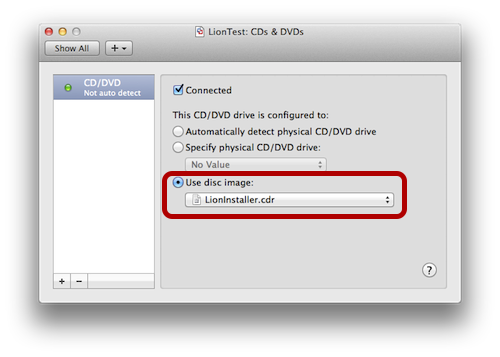 Before the packages can be copied from the Lion installer image, there’s a file on your installer image that needs to be deleted. Use the Terminal to do this and be aware that this operation might take a few minutes because it’s copying several gigabytes of data. Both installer images can be ejected. 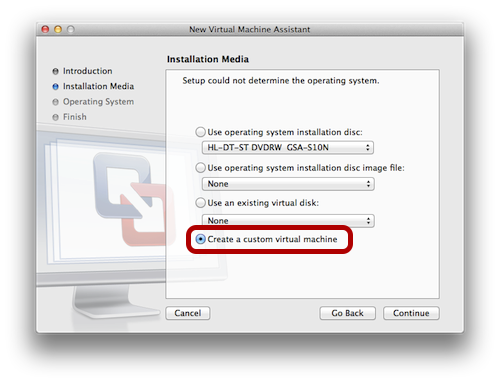 Select “Create a custom virtual machine” and click Continue. 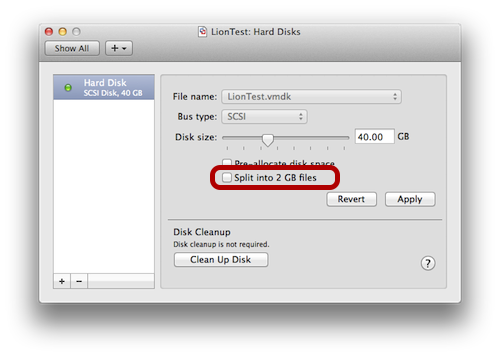 Click the “Customize Settings” button and name and save the new virtual machine – my VM is saved as "LionTest"
Deselect “Split into 2 GB files” for the pre-created hard drive and click Apply. Feel free to make any other changes to the settings with one caveat, you must use a SCSI hard disk; IDE drives are not recognized by the installer after it boots. Also, if the hard disk is going to be used as a boot disk, it cannot be split into separate 2 GB files, so make sure to deselect that option when the HD is created. Locate your VM within the Finder (mine is in my Documents folder and is called LionTest), right click and select “Show Package Contents”. 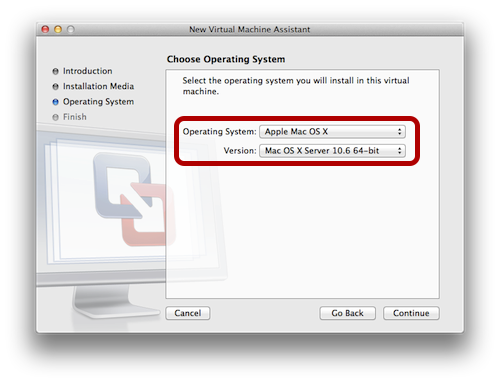 Now you should be able to run the VM and it will boot up and start the Lion installation process. Continue with the installation. When the installation is complete, it will attempt to reboot the VM using the freshly installed OS on the hard disk. It won’t boot, because it’s not a server installation. # touch "/Volumes/OS X Lion HD/System/Library/CoreServices/ServerVersion.plist"